I am uncomfortable with the word “genre” when we use it about science fiction. This is partly because it is inaccurate: strictly speaking, genre refers to whether a work is poetry, prose or drama, and science fiction is certainly not generic in those terms; more generally, genre refers to story conventions, a crime or a romance and so on, and there is no such conventional structure for a science fiction story. But I mostly object to the word “genre” because it narrows our expectations. We look for generic patterns in fiction: is it set on another world, in the future, on a spaceship, and so forth. The list of generic patterns is huge, but it still restricts our perspective on what we are reading, and if we don’t find the patterns, well, it’s not really science fiction, is it. Except that science fiction, if it is doing its job properly, should be introducing us to the new, the strange, the different, and you can’t exactly do that if the tools you are restricted to are the old, the familiar, the generic. So I often find that the works that best generate the shock of the new, which seems to me to be the fundamental role of science fiction, are those works that owe least to genre conventions. 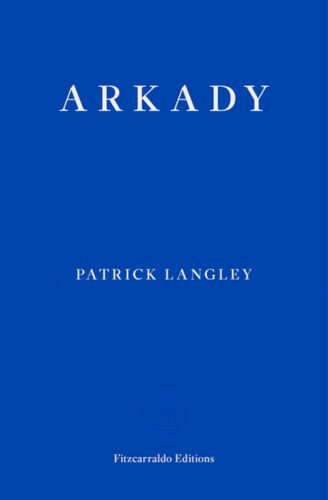 With that in mind, I have to ask myself whether Patrick Langley’s debut novel, Arkady, is science fiction. And the answer is: I don’t know, and I don’t care. It is perfectly possible that this novel is set in the here and now, is strictly realist in affect. If that is the case, it is a perspective on our present moment that the vast majority of us will, hopefully, never share. It is equally possible that the novel takes us a year or two into the future, a view from the bottom of a coming economic collapse. Either way, it has the feel of something so near we can almost touch it, just over there beyond the outskirts of our town, in that wasteland where most sensible people never want to go. It is real and disturbing and beautifully written, and that should be enough to counter any facile genre arguments. Arkady comes closest, I suppose, to being a dystopia, but it foregoes the trendy heroism, the uncovering of the core weakness at the heart of the monolithic state villain, the ascent to everything being all right in the end, that too many recent dystopias have led us to expect. This dystopia is ordinary, grubby, sad, a world of making do and getting by. It is not unremittingly bleak, there are everyday human joys; but nor does everything come right in the end, because the world just isn’t like that. There’s a lot of good in the people our heroes meet, but goodness generally isn’t enough. Jackson and his brother Frank lose their place in an ordered society when they are very young, Frank still a toddler, Jackson not much older. They are on a family holiday in Spain when their mother dies, possibly killed by their father. It isn’t clear what has happened; Langley stays resolutely within the viewpoint of Jackson who really doesn’t understand what is going on. What he particularly does not understand is how much their lives have changed in one incomprehensible moment. The brothers lose both their parents on that day, and all Jackson really knows is that it is now up to him to look after Frank, and this becomes the one certainty in their lives through all that follows. We are given sudden, sharp glimpses of their childhood. They live with a guardian who tries to do the best for the kids but whose own financial and health problems mean that he can offer little in the way of adult authority, so Jackson and Frank run free, exploring an urban hinterland of abandoned buildings, ruins and wasteland. School can do nothing to encourage Frank’s bright creativity, or assuage Jackson’s morbid worries. Then, in among the mudflats beyond the city limits, the monotonous stinking landscape that seems to be the natural and inevitable setting for this story, Jackson comes across an abandoned canal boat. It is filthy, the wood is in need of repair, but it is basically sound and, miraculously, the motor still works. Frank christens the boat “Arkady” and the boys adopt it as their home. The name tells us so much about this novel, and the two sharply drawn and engaging protagonists. It is a conflation of Ark, suggesting a refuge from the rising flood waters of economic decay that is the world all around them, and Arcadia, the promised land, the pastoral bounty that awaits outside the city. Jackson and Frank are tough city kids, used to running free, well adapted to the harsh urban environment; but the city, as we begin to glimpse it, is an unforgiving place with nowhere left for the poor, the outsider, those who survive on the edges of society. That dire economic state is not addressed directly, nor is it evenly distributed. We see it only obliquely, initially in the demonstrations verging on riots that seem to form a background to any journey into the city. People are protesting not against governments but against corporations. From this perspective, governments are largely irrelevant; the people with the power are those who are doing very nicely while increasing numbers are struggling to get by. There is an undercurrent of anger that powers the novel, but Jackson and Frank themselves are not angry: they have never had economic security, so they don’t particularly resent its loss. For them, the demonstrations are close to being a spectator sport as they grow adept at avoiding the worst of the violence while keeping an eye on what is going on. Nevertheless, like anyone else on the outside of society they find themselves drawn to the countercultural groupings that start to grow up. In particular they moor Arkady close to an old industrial building that has become a large, shambolic squat, filled with everything from artists to activists. They are not part of this community, they are too used to fending for themselves, but they are welcomed as friends, become a part of the daily life there. But however welcoming this life is, it can only ever be temporary; for those on the edge there can never be lasting security. Commercial interests have their eye on the site of the squat, they have the courts backing them up, and they have their own private security army to act on their wishes. The attack on the squat is brief, brutal and bloody, and Jackson and Frank only just escape the violence. But they are not unscathed. Frank, who has more and more been taking over the role of protector from Jackson, has to kill to help his brother get away. It is an event that changes their view of each other, and of the world around them. By the end of the novel they are barely out of their teens, but they are old in the ways of the world, in coming to terms with the fact that there is no place for them outside the limited society of Arkady. The novel shows us a world that is unmistakeably here and now, but unrecognisable at the same time. There is nothing overtly fantastic, nothing alien or strange about the book, other than its perspective. But it makes us see the world anew, which surely is what the best science fiction is supposed to do.